ST. PAUL, Minn. -- Faith leaders and musicians delivered messages of hope Thursday at a funeral for a black Minnesota man who was fatally shot by a suburban St. Paul police officer. 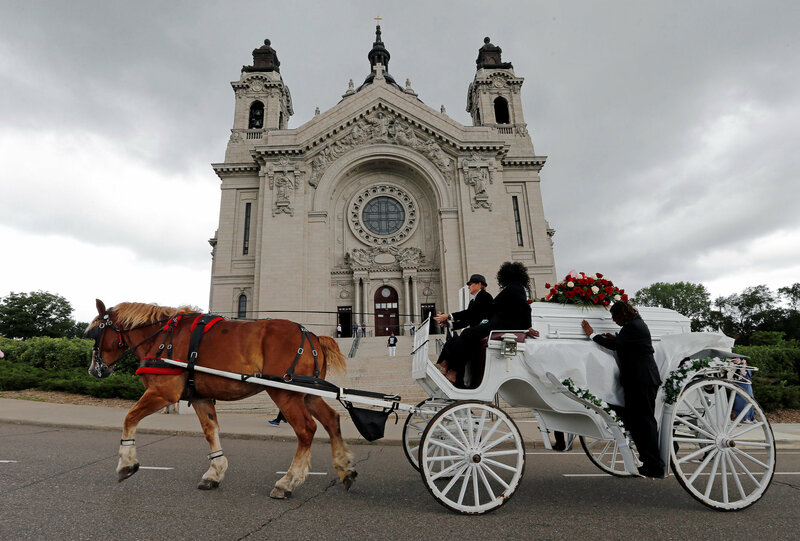 Mourners filled the 3,000-seat Cathedral of St. Paul to pay their respects to 32-year-old Philando Castile, whose white casket arrived and left on a horse-drawn carriage. After the service ended, people lined up along the cathedral's long stairs holding "Unite for Philando" signs as Castile's casket passed. Castile was shot several times by a suburban St. Paul officer during a July 6 traffic stop. Castile's girlfriend streamed the shooting's aftermath live on Facebook. The Rev. Steve Daniels Jr. of Shiloh Missionary Baptist Church asked during the funeral why racial profiling still happens. He says he's thankful for police and their service, but that people need to find a way to come together. Gov. Mark Dayton, who has suggested that race played a role in Castile's death, attended the service. Castile's girlfriend said he was shot while reaching for his ID after telling the officer he had a gun permit and was armed. CBS Minnesota reported a letter from the Hennepin County Sheriff's Office confirmed Castile, 32, got his permit last year. The letter, dated June 4, 2015, said Castile's permit was enclosed. It required him to have his permit card and photo identification when carrying a pistol, and to display those items "upon lawful demand by a peace officer." Allysza Castile says she and her brother took a gun class together last year. They went to Total Defense in Ramsey, where owner Dan Wellman says they teach students to hand over their permits with their driver's licenses. The attorney for St. Anthony police officer Jeronimo Yanez says Yanez was reacting to the presence of a gun when he fired.